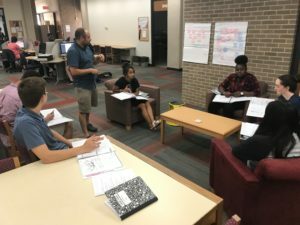 Welcome to Rise Up & Write, an advocacy writing summer camp for high school students. Rise Up & Write provides youth with the opportunity to use writing as a way to raise awareness and create change. 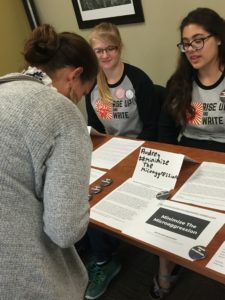 Rise Up & Write is a program from the University of Wisconsin – Madison School of Education, the Greater Madison Writing Project, and the National Writing Project. Follow the link in the title to access each program application! 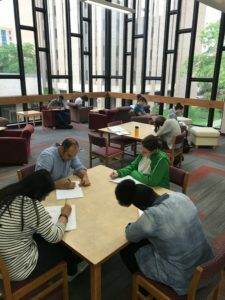 Rise Up & Write is a program from the Greater Madison Writing Project and the University of Wisconsin – Madison. 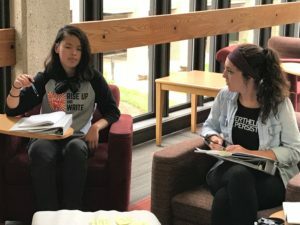 Rise Up and Write will bring together high school students interested in issue advocacy through writing. 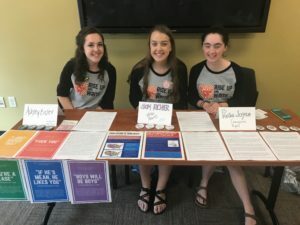 Youth writers will work together and with professional teachers of writing to read, research, and write for awareness and change around issues that matter. Rise Up & Write is supported by a grant from the National Writing Project. 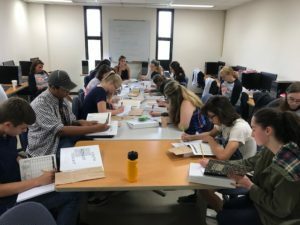 Hear what past participants are saying about Rise Up & Write! What did you like about Rise Up & Write? I loved getting to meet new people and making new friends. It was such an incredible experience to be around people with similar views as me and all have something we are passionate about. The atmosphere of Rise Up & Write was so welcoming and fun. Everything! One thing in particular I really liked about this camp was how passionate everyone was. Most people made the choice to be here and came ready and willing to roll their sleeves up and get to it. Nobody was afraid to be engaged and share their writing. Also, the facilitators were amazing! 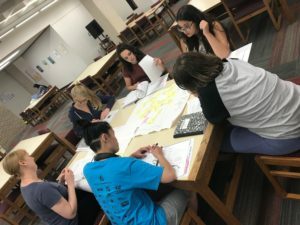 All were very receptive to the issues we were facing with our writing and were eager to help us pick them apart until we figured out what would work for us. I was never afraid or embarrassed to ask for help because the adult leaders encouraged embracing our frustration or roadblocks and pushing through them. In general, I loved the entire program. I really enjoyed working with people on the same general topic as me. It was awesome receiving feedback and help from both my peers and the advisors. Has Rise Up & Write change the way you think about yourself as a writer / activist / both? This camp made me feel empowered. Rise Up & Write changed the way I think about myself as a writer because I feel like I can do more. As a writer, I got pushed and as a result, my writing got better. It has inspired me more to want to make change in the world, and has given me more self-confidence and even more connections! Registration materials will be sent to participants after their application is reviewed and they are accepted into the program. Applicants can expect a response within one week. Please see application for session pricing! Early Bird Discounts available to participants who have been accepted and registered by May 1, 2019!